Red morocco with Elmhirst arms. 1 roll, bound : vellum, ill.
George Josslyn L'Estrange Howard, Earl of Carlisle; his sale, London, Sotheby's, Oct. 28, 1947, lot 530; Edward Mars Elmhirst; Mrs. Elmhirst; purchased for Curt F. Bühler at her sale at Sotheby's (London, Jan. 26, 1959, lot 51) by E.P. Goldschmidt, London. 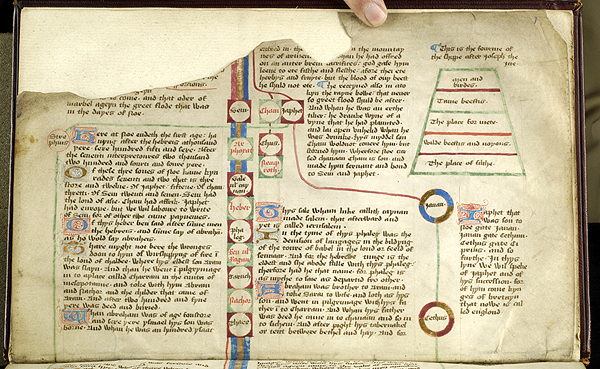 Ms. genealogical chronicle roll in Middle English; written and decorated in the late 1460s. Lacks all text before Noah; ends with Edward IV and his daughter, Elizabeth, who was born in 1466--Cf. PML files. Written on two leaves of vellum at the end in a contemporary hand is a 16th century English poem addressed to Henry VIII, in 9 seven-line stanzas--Cf. PML files. Two contemporary genealogies of the kings of England, both also ending with Edward IV, are in the Bodleian Library, Oxford (mss. e Mus. 42, Lyell 33). Continuous roll folded into 62 leaves + 4 added leaves = 66 leaves (338 x 220 mm. ); 3-4 columns, 39 lines (182 x 272 mm. ).